The Full Vision Glass Front Display Case from Store Supply Warehouse is a practical and economical way to showcase your most precious merchandise. 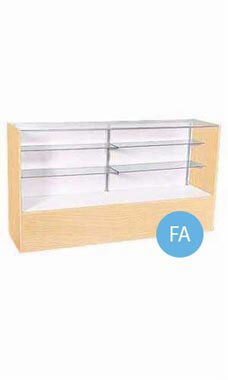 Featuring a tempered glass front and top, with two rows of adjustable 1/4" split glass shelves, the display case will present antiques, jewelry, hats, trinkets, or other memorabilia for customers to easily view. The display case has low pressure melamine laminate exterior with a white deck and doors, as well as aluminum hardware with optional lock and light kits sold separately. Overall dimensions measure: 38"H x 18"D x 48"L. The 48" Full Vision Case with Maple finish is a classic unit that will give you years of affordable elegance and dependability for your retail store. Crating for secure shipping is included in the price of the case. Fully assembled and ready to ship. The displays were a little smaller than I expected. They are pretty good value for the money, however, one of the sliding doors doesn't slide very well because of the way it's made. Overall, they look pretty good.